The barred owl was resting on a branch just a stone’s throw from the road. So close. We’ve heard their “whoo-whoo-who-cooks-for-you” call many times in that part of the preserve, but this time the bird was low to the ground and close enough to examine. It was the middle of the day, and the owl was sleepy. Its beak sank into the triple-striped frame of chocolate brown feathers around its face. Languidly, it opened its black marble eyes and blinked at us. It turned its head, swiveling to face the other side of the tree. A man passed by, going the opposite direction on the trail. “It’s a barred owl,” we said, our faces lit. “Oh,” he nodded. “A big one.” There was some acknowledgement there. But he hardly slowed his pace as he walked past. “Too dark to get a picture,” he said. He couldn’t document the experience and share it with his friends and family. Merely stopping to see the owl’s astonishing, graceful movements wasn’t worth his time. He had no sense of wonder. 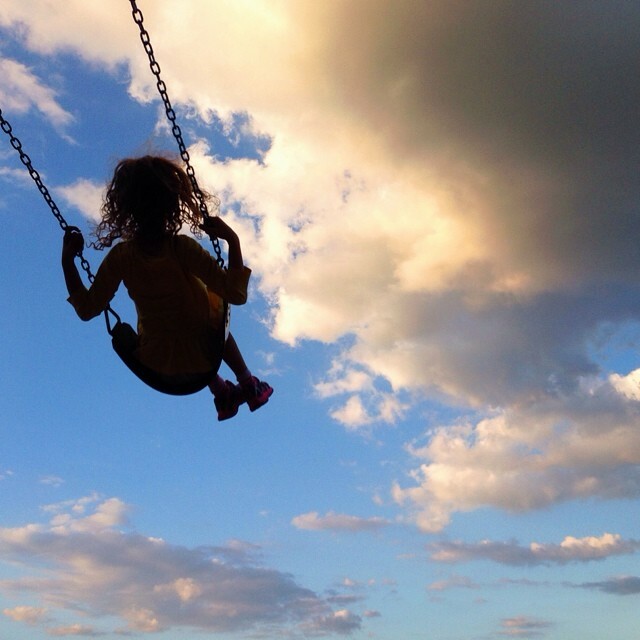 But our children are born with a seemingly infinite capacity for wonder. They are delighted when the grackles strut-shuffle across the front yard in search of their breakfast, every color of the rainbow secreted in the folds of their oily black feathers. They jump up and down, pointing and shouting, when they find that robins have built a nest in our very own yard. Fragile blue eggshells fall to the ground, and they just lie there, waiting to be discovered! The moon shines in the night sky, and it changes shape! Did you know that? It’s wonderful! What’s more, there are stars, and occasionally they fall, and you can actually see them streaking across the sky. We rush to fill our children’s minds with useful information. They need to know their alphabet, their multiplication tables; they should know the names of some presidents, and the periodic table. But all of that is available at any moment of the day, with the touch of a finger. It’s the capacity for wonder that children lose too quickly, the capacity for wonder that needs the most nourishment. I would argue that this is the crucial beginning of our children’s understanding of God. Apart from wonder, how can anyone appreciate the majesty of creation, the mystery of incarnation, the magnitude of omnipotence? On another of our visits to Radnor Lake, we found a nest of barn swallows at the top of a porch beam. Instead of keeping to our schedule and hurrying home to get the kids in bed, we sat down in the rocking chairs on the little cabin’s plank porch and watched four baby birds crane their necks over the lip of the nest. The kids cooed and laughed at the fragile little puffs of gray fuzz with wide, thin yellow beaks. Mommy and Daddy Barn Swallow swooped in and fed the hatchlings, taking it in shifts to keep their brood fed. We stayed a while watching, listening to their tiny chirps. With the flick of a finger, we could have learned all there is to learn about the anatomy of barn swallows, about their feeding and mating and nesting habits. But we thought better of it. Come sit a while. Drop your books at the door. Welcome to The School of Wonder. Been musing along the same lines these past few weeks. It’s incredibly helpful to have younger children to keep that sense of wonder alive in a house. Our 6-year-old still provides that inspiration for us but I already grieve the loss of her wonder, both for herself and for what it does to the other five of us in the house. wonder that needs the most nourishment”. Thanks so much, Aimee. Makes me think that’s one of the major reasons parents speak so wistfully about when their kids were younger. In a recent Audubon bird song class, we stopped to listen and identify different birds. One man looked into the forest and saw a Great Horned Owl, sitting low on a branch, being dive bombed and scolded by anxious mama Robins. Each of us slowly and carefully found him in our binoculars. Wondrous indeed! Perhaps a penny spread for us that morning. Just lovely Helena. Great reminder! Sometimes kids need to be reminded to wonder too…I just taught my 13 year old how to build a fort out of sticks. I got him started and then the wonder began again. Wonder starts with an awareness that it is available to us every day, if we choose it. Thank you!